As with the other MAB hospitals in Dartford the colony had its own farm. The farm consisted of 164 acres at Darenth Park and a further 47 acres adjacent to the Southern. In 1927, 103 acres were arable and 46 grassland, in addition to this the farm buildings and yards stood on 3 acres. Patients were employed in every department and there were only 7 paid staff including the farm bailiff. In 1927, the livestock consisted of 25 Dairy Longhorn cows and 1 pedigree bull of good origin. Calves were sold quickly and poor milkers weeded out. The average yield per cow exceeded 2 gallons. This was extremely good as the Ministry of Agriculture stated that the average yield per cow in Kent was 15½ pints. Pig keeping was an important branch of the farm. Their well-known ability to convert swill into a saleable commodity was utilised fully. A pedigree herd of 300 pigs was kept. The staff and patients consumed all the pork reared. Sheep (a flock of about 100) were to be reintroduced to try to keep down some of the coarser grass areas that the other animals couldn’t graze on. Approximately 200 hens of mixed variety were kept for eggs and meat. The patients and staff consumed all the eggs. Five horses were kept for pulling carts and ploughing. The yearly consumption of potatoes was 220 tonnes and half that amount in green so efforts were made to grow these amounts. There was usually enough green vegetable to last the year but they could only grow enough potatoes for 8 months consumption. The South Eastern Agricultural College at Wye periodically inspected the whole farm and any advice they could give was usually acted on. b) To provide milk, vegetables, meat, poultry and eggs for consumption in the institution. c) To utilise waste material, always a large item where so many people were housed and fed. The hospital was totally self-sufficient having its own well and gas works. Both were also supplied to the Upper and Lower Southern Hospitals as well. The well was sunk to a depth of 225 feet to reach the water table. It had been carved out of solid chalk by manual labour, with cane skips to haul the chalk to the surface. It was 7 feet in diameter and at the bottom had two ‘headers’ (tunnels, extending outwards to a length of three hundred feet, one east and the other north-west). The method of descent had been by wooden ladders with horizontal staging at 10-foot intervals. This was replaced later by iron ladders and staging, low voltage electric light and an air purifier system. Water was raised from the well by means of a pump. In 1923, a new pump was installed to increase the water pressure in case of fire at either hospital. Later two electrically driven submersible pump units each capable of delivering 167 gallons per minute were fitted. One pump was held in constant readiness in case of the other breaking down. The water was delivered to a 250,000 gallon concrete reservoir at the rate of 8,000 gallons per hour. The reservoir was adjacent to the boiler house. Chlorine was added to the water and the water then went to the main water storage tank and to 116 overhead supplementary tanks in the roof voids of the wards and buildings. The pumps were lowered and brought to the surface by means of a winch. In event of both pumps breaking down, there was an auxiliary supply from the water board, which discharged straight into the reservoir. This was only used in an extreme emergency. In 1971, the hospital used 60,000,000 gallons of water annually. It took 6 months for rains to penetrate the soil and chalk to reach the water table. The gas works occupied 3 acres of land in the extreme south-west corner. The plant consisted of 28 retorts in four series, two boilers of the Cornish type, four gas holders with a total storage capacity of 120,000 cubic feet of gas, purifying boxes, various pumps and machinery for making sulphate of ammonia. The maximum productive capacity of the plant was 230,000 cubic feet of gas per day. This was ample, as the consumption was not known to exceed 150,000 cubic feet. The yearly carbonisation accounts for aver 2,000 tons of the best coal, yielding over 25 million cubic feet of gas, a result that compared favourably with large gas works for public supply. Production costs were also well below average. The gas works closed in 1927. West Kent Electricity Board supplied electricity to the hospital. The cost of wiring the hospital was £9,300 and was installed in 1926-7. The hospital had it own cemeteries. The old cemetery (now called Southern Rest) was 200ft x 250 ft and was consecrated by the Right Reverend Dr Claughter, late Bishop of Colombo and Archdeacon of London, in December 1878. Most of the graves were pauper graves, in epidemic years they would have been several bodies in each grave (a maximum of 10). They would have been buried in sacks stuffed with straw to absorb the juices. A few were given headstones. One Annie Eager died in 1894, aged 45, and was given a headstone by the MAB. The inscription reads ‘ Well done good and faithful servant’ and ‘This memorial stone is erected by the Metropolitan Asylums Board as a token of their admiration and esteem for a tried and faithful officer.’ A unique honour in a hospital cemetery. The remainder of the cemetery was filled with German War dead from the Great War. These graves were later exhumed by the War Graves Commission and moved to Cannock Chase. The register for this cemetery has been lost. The new cemetery (now called Darenth Rest) was consecrated by the Bishop of Rochester on 31st October 1918 (a copy of the cemetery register is held at the library, Joyce Green). The War Memorial for the Darenth Training Colony was unveiled on 16.12.1927 by General Fell. This Memorial has now been moved to the entrance of this cemetery. The industrial side of the institution was, in 1930, turning out goods to the value of £70,000 per year. The principle purpose of the section was to keep the patients usefully occupied, happy and contented, and give them an interest in their tasks. The industries carried out for males were: baking, book binding, bricklaying, carpentry, domestic work, engineering, farming, mat making, mattress making, painting, plumbing, printing, shoe making, tailoring, tinsmith work, toymaking; for females: domestic work, laundry work, needlework, rug making, sock and jersey knitting. In 1930 the running of the asylum changed from the MAB to the London County Council (LCC) and in 1939 the name of the asylum changed to Darenth Park. It housed (until the 1950’s) entirely adult patient’s. In the 1950’s, a review of the life of patients at Darenth Park was made in The Lancet. The aim of the hospital was to return the patient, after training, to the outside world, if possible. There were about 1,800 adults there with mental defects, 1,100 men and 800 women. The large proportions of admissions were ‘high-grade’ and trainable. Of the 1,800 patients, 300 were working outside the hospital on a weekly licence and 192 on a daily licence. It was found that the patients made keen workers. Some worked in the gardens and on the farm. Others helped with the maintenance as bricklayers, carpenters and decorators. The carpentry shop turned out benches and stools. The tinsmiths, kettles, coalscuttles and other household articles. Some of these items were made for outside orders. In 1951, over 3000 books were bound there and more than 500,000 forms printed. For the work the patients were paid 5-10s weekly as pocket money, the exact amount depended on performance, the remainder was banked for them and they could withdraw this by applying to Matron. They could buy clothes, presents or send it home to relatives, which was good for their self-esteem. The doctor often found himself fending off relatives, who once they found out the patients could earn a decent wage did not hesitate to try to claim the money. The review found that life at Darenth was like living in a town with good community spirit and plenty of social life. There were dances, filmshows, coach outings and clubs. In 1959, children were reintroduced to Darenth Park. A school was opened and in 1967, a new wing for boys aged 11-16 opened and another planned for girls. The school was for severely sub-normal children, most had other handicaps as well. The aims were to improve the speech, mobility and social habits of the children. The school closed in 1978 and the children’s schooling transferred to the new Milestone School. Socialisation of the patients to enable them to lead normal lives was an important object of the hospital. But apart from those who required care under the Mental Deficiency Acts 1913-1938, there were also those who were maladjusted and with or without subnormal intelligence who needed care under the Criminal Justice Act 1948. The number of these patients admitted to Darenth Park increased year by year and it became necessary to open a special ward in 1949, to help stabilise the 44 patients whose conduct and behaviour was undisciplined and irresponsible. The staff were helped in the socialisation process by two innovating psychologists (Dr Jack Tizard and Dr Neil O’Connor) who were seconded to Darenth Park from the Medical Research Council’s Social Psychiatry Unit at the Institute of Psychiatry. They were conducting an experiment on the effects of three different types of supervision upon the productivity and behaviour of high-grade defective adolescents. For three months strict discipline, friendly discipline and laissez-faire discipline were practised in turn. The patients preferred the strict discipline but their performance was better when supervised by lenient, kind and friendly persons. Learning and behaviour was affected by the refusal of the supervisor to take an interest in the patient’s worries. The worst kind of discipline was laissez-faire, as it gave no positive direction. A number of tests were carried out on the patients to gauge their suitability to work and whether they were suitable to work outside the hospital on a daily licence. Patients were employed by companies through the Social Adjustment Centre either on a daily licence or in workshops in Darenth Park. They were paid by the firm, calculated by converting trade-union female rates into piecework rates. The secured contracts in box and carton making, finishing plastic products, wiring electronic organs and fitting plugs. For the first time patients were employed suitably, and by doctors. Previously all the workshops were run by the craftmaster, who surveyed his domain of mattresses, shoes, brooms and doormats and only answered to the finance officer, who spoke directly to the group management and had no contact with the medical or nursing staff. So developed two rival activity centres at opposite ends of the corridor, one chronically craft orientated and the other social awareness orientated, with music while you work (for the first time), and the oppressive industrial regime at Darenth started to decline. In the 1960’s, it was decided to close large institutions for mental illness. 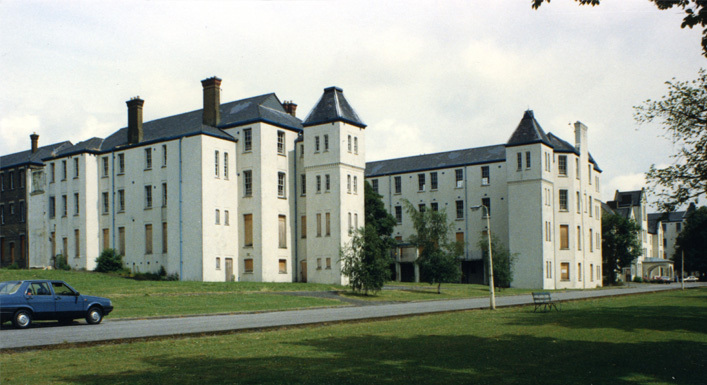 Darenth Park was too big, too old, too run down and too isolated to meet modern standards of care. There was only one lift in the entire complex and the blocks were 3 storeys high. The central heating system was too old and not powerful enough to heat the hospital properly in winter. The decoration was poor and it needed re-wiring. The hospital was isolated and difficult to reach. Its catchment area was huge which meant that relatives had a long and difficult journey. The hospital was closed slowly as four out of ten patients had spent more than 25 years there. In 1977 the hospital was sectorised – split into “mini-hospitals” each serving its own catchment area- thus paving a way towards community-based care. The Dartford and Gravesham Community Health Council criticised the plans because it meant that friends of many years would be parted and this could have a traumatic effect on the patients. They said the move should be gradual to allow the patients time to adjust. Facilities for mentally handicapped patients were made at Joyce Green (Orchard House) and Archery House at Stone was built, also a number of small hostels formed. The patients over the next decade were reduced as they were returned to their own Boroughs or were found places in the community. The logistics of the task were huge. They had to prepare people who have been institutionalised for years to live in the outside world. There was a ‘moving-on’ flat at Darenth Park where they taught them to cook, catch a bus, queue, shop and handle money and to stop saying hello to everyone who passed them in the street. Some of the patients were moved to Bassetts in Bromley. Opened in 1987, there were 9 houses for 72 people. Each resident had his own address and telephone number. They had to be taught to use a door key as they would ring the doorbell and wait for an answer. The fear was that the ex-patients would not change and still act as if in an institution but most of them started to adapt after one month and the rest by six months. Only a few took much longer to adapt. To start with the ex-patients were resentful when told to cook, clean and shop after a lifetime of having meals prepared for them. A different approach was needed. When asked to help please, they were much more willing. Obviously not all patients were able to adapt as well to modern living, but the majority coped very well, most of them today would not have been in institutions in the first place. The hospital finally closed in 1988. The Hospital Management HQ closed in 1994 and the buildings demolished in 1995.